Pull up a seat, grab a cuppa and let’s have a quick update. I’ve been MIA the past wee while as I was totally floored by the flu. I’ve never had flu before, and they weren’t kidding that you can’t do anything. 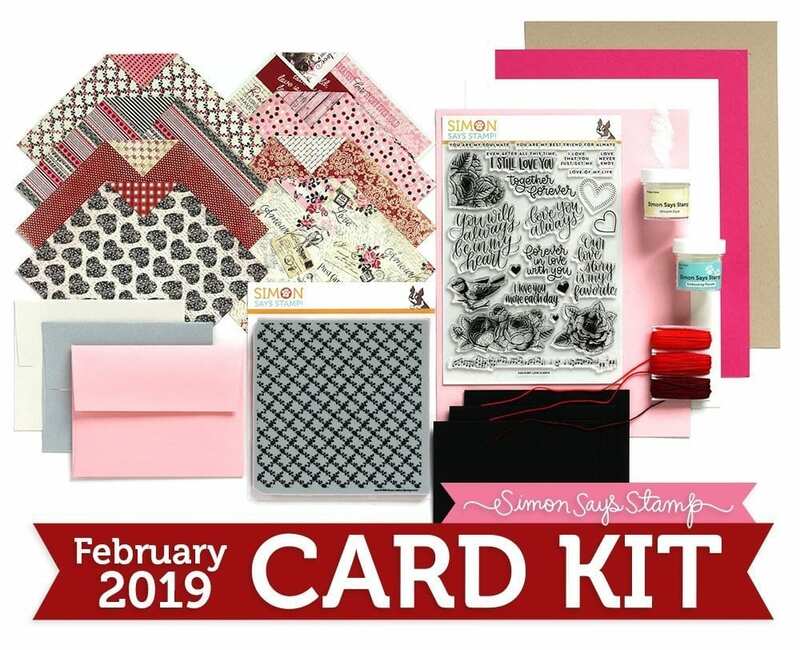 I tried to sit at my desk earlier in the week for a quick update on the February Card Kit from Simon Says Stamp, and I simply couldn’t do it. I have never failed in soldiering on regardless! I was a hot mess, literally with a fever and all I could do was sleep. I am so glad to say that I’m starting to recover now, but, I have passed the bugs on to two of the children, so I’m now on Mum duties. I made and edited this video just before I became ill, and it seemed a great time to share it with you. 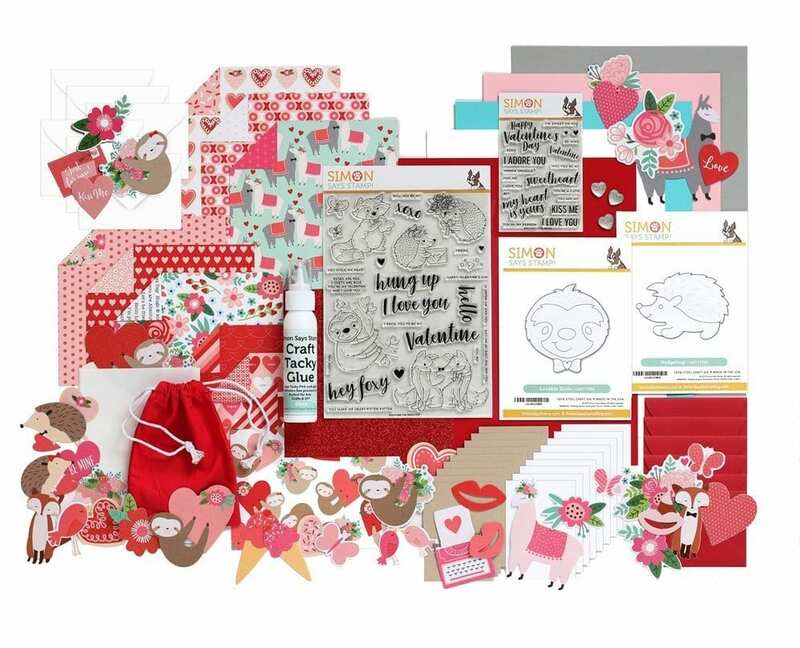 Although I’ve not managed to make anything with the February Card Kit or the new just out today Limited Edition Valentine’s Card Kit (more on the kits below) this project does have a Valentine’s theme and could easily be adapted to be used with one or both of the kits. So first off I’ll share more about these cute Valentine’s pockets and then if you keep scrolling you’ll get to all the details on the two new card kits. I’ve linked all supplies at the end of this post. Compensated affiliate links used where possible at no cost to you. 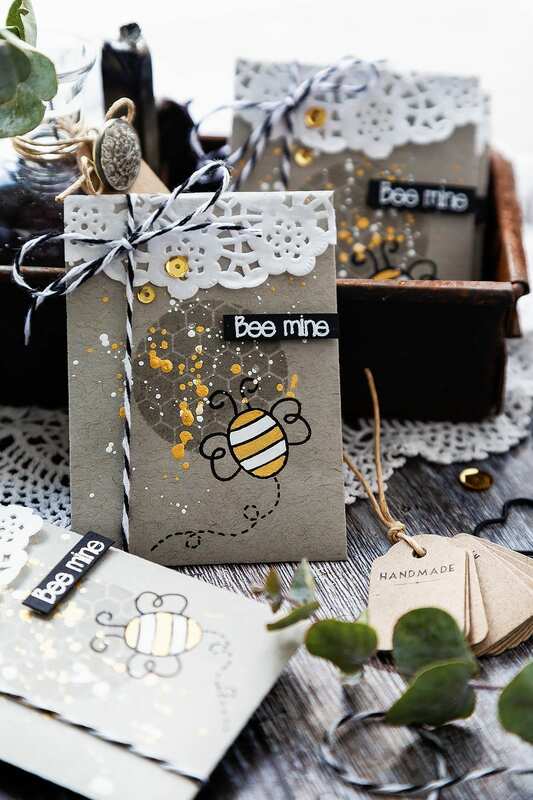 These cute Valentine’s gift pockets are super quick to make and are easy to mass produce so let’s crack on and take a look. Kraft card is one of my favourites to work with, and I love the cooler hues of Toned Gray from Strathmore. 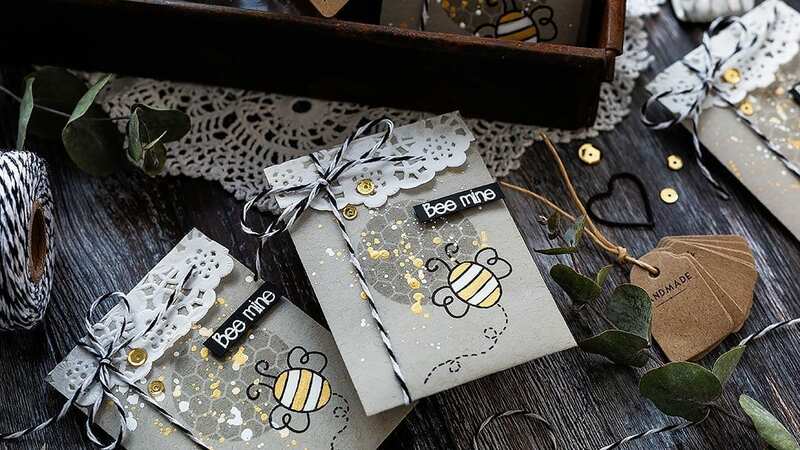 It’s more of a thick paper weight than a card, but actually, that makes it work well for these gift pockets as it folds easily without any cracking on the edges and also the smoothness of the surface makes it great for stamping on. You could cut and fold a pocket yourself, but I like to use this Gift Card Envelope die from Simon Says Stamp. It makes a great sized gift pocket for tucking in a little treat or even as the name suggests, a gift card. I cut the Toned Gray paper lengthways to 5 inches, and from this, I was able to die cut two pockets and then keep the rest of the sheet for another day. To decorate the pockets I used the Circle Friends set from Simon Says Stamp. It has some really cute images, circle background patterns and puny sentiments. When an idea for a project hits me, I love flicking through my stamp sets to find ones that work with the idea, and it’s great to pull out an older set too and give it some love. Thinking about it, the gift card envelope die is also an oldie but goodie too so I encourage you to dig through your stash and pull out some favourites from the past. 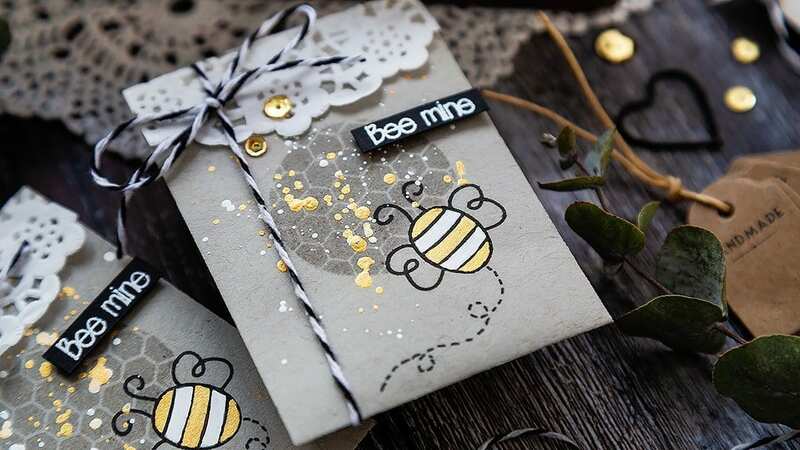 I arranged the bee and honeycomb circle on the front of the gift card envelope die cut and then removed the background circle so that I could stamp the bee in Versafine Onyx Black ink. 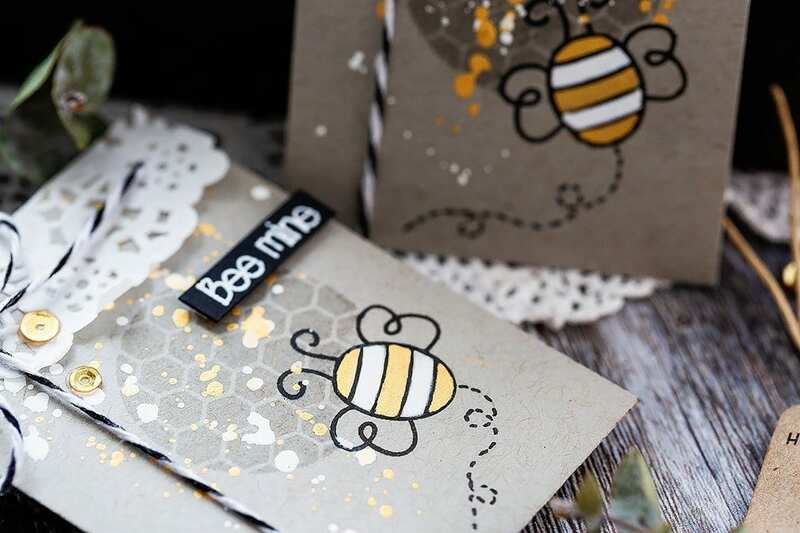 I stamped it a couple of times to ensure a good impression, and I stamped the residual ink onto masking paper, trimmed around the image and then applied the mask to cover the bee. I then realigned the honeycomb image, and for the sake of my OCD, I used a T-square ruler to ensure the lines were straight. I think it’s best to have lines straight or if not then at a quirky angle but not just off if that makes sense. So with the image lined up, I stamped it several times in clear embossing ink to darken the card for that tone on tone look. Keeping the mask in place, I then pulled out my favourite white gouache, added a little water so that it was of a suitable consistency and then splattered over the background. I love keeping my colour scheme quite neutral when working with kraft, perhaps using just black and white with a pop of colour. In this case, I debated trying to bring in yellow for the bee but thought you can’t beat a bit of gold with these colours, and it still goes nicely with the bee theme too. So I used Iridescent Gold from Daniel Smith and again mixed with a little water before splattering over the pocket. I lifted the mask, and I also used some of the gold to paint three of the stripes on the bee. I was debating whether to paint the other two stripes black but thought that might all get a bit dark and dull. Initially I left them just without colour, but later on, I painted them white. Now I know bees are traditionally black and yellow, but this colour scheme seemed to suit the project better, and it still reads as a bee to me. Having dried the paint, and with all the stamping done I then constructed the pocket. I love this die and use it a lot and one of the reasons I love it is that it is so easy to put together. You just need to piece of tape, one on one of the long sides and one on the bottom flap. I like to fold the sides in and then have the bottom flap coming over the top in a seed packet sort of way. I used Scor-tape as I find it nice and strong and it keeps the pocket secure. To bring a little homespun feeling to this gift pocket and also to lighten the overall colour scheme I added a piece of doily to the top of the front of the die cut. I trimmed a piece so that just the decorative edge was showing and then kept it in place with a few dots of Gina K Connect glue along the top edge. I didn’t adhere it down totally as I like to ruffle the edges slightly for dimension. 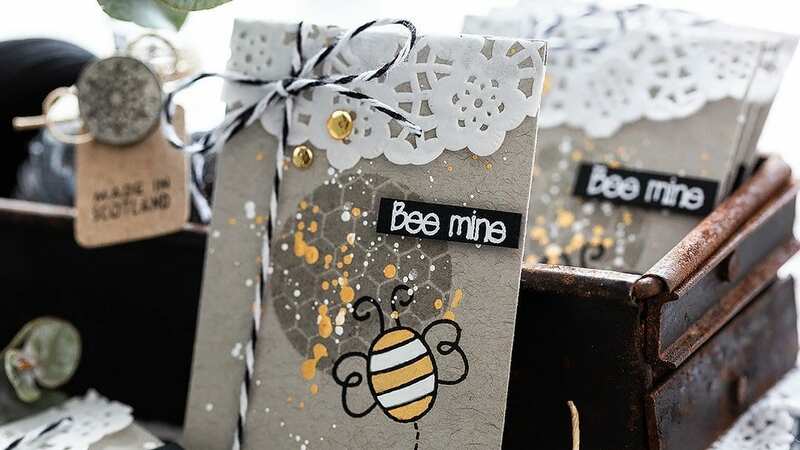 The puny sentiments in the Circle Friends set are great, but there wasn’t the Bee Mine sentiment that I had planned for these Valentine’s pockets. However, I put the phrase into the search at Simon Says Stamp which brought up some stamp sets that might work. I use the search facility at Simon a lot for this sort of thing. 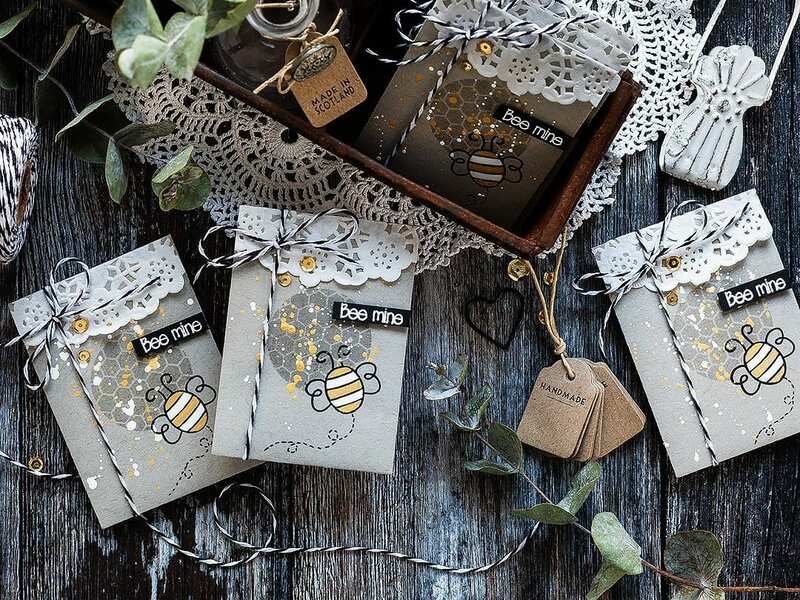 I then looked down the list and spotted this Clearly Besotted In Print set that I had which contained the Bee Mine greeting and in the perfect size too. I aligned the sentiment on a piece of black card, treated the card with an anti-static powder bag to help prevent embossing powder randomly sticking everywhere and then stamped it in clear embossing ink before sprinkling with white embossing powder and heat setting. I trimmed the sentiment to a skinny strip and then added it to the pocket with foam adhesive. Within the Circle Friends set is an image to stamp to create the dashed line trail of the bee, however, I knew it was going to be too big for these petite pockets, and so I sketched out a trail in pencil and then used a black pen to draw a dashed line over the top and then erased the pencil line. To keep the pocket closed and to add another element and bring in more texture and dimension, I wrapped black and white twine around the pocket and tied in a bow over the doily piece. As a final accent, I added a couple of gold sequins held in place with Gina K Connect glue. It was at this point that I decided to go for it with the white stripes and used more of the white gouache to paint them in. Having worked out what I wanted to do, it was easy to recreate more of these. 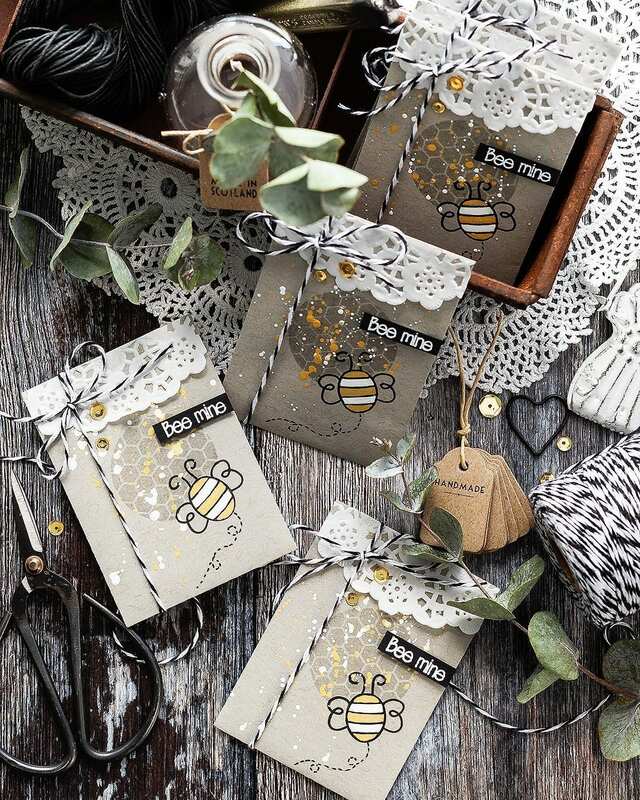 I set up a quick batch production, die cutting the pockets, stamping the bee, adding the mask, stamping the honeycomb, quick splatter with the paints, remove the mask and so on and I made six more of these pockets in a flash to complete this project! 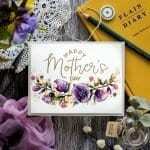 So let’s take a look at the two card kits out this week from Simon Says Stamp. First up is the February Card Kit. Such a great kit with an elegance to it that appeals to me and I can’t wait to use the Love Always set. I’m debating whether to paint the flowers with watercolours or colour them with pencils. Thinking of how this kit could be adapted to my treat pockets above, the flowers from the Love Always set would look lovely stamped on the front of a Toned Gray pocket either in black ink for a classy look or perhaps with a no-line coloured look with pencils. I will be sure to share what I choose! Hopefully, it won’t be too long until I’m well enough to start making videos again. This is a Limited Edition kit, and that means that it isn’t part of the monthly card kit subscription. These Limited Edition kits sell out super fast so if you fancy one then I’d get straight over to Simon and put your order in. I haven’t got this kit quite yet to work out the sizes of things, but I think many of the cute Pebbles Inc shapes would work well on the front of a Valentine’s pocket. Perhaps this time cut from some of the lovely Pebbles papers included in the kit. I always want to check out the cute images in The Sweetest set, and the Hedgehog and Loveable Sloth dies too! OK, so that’s all for today. I apologise for this being a rather long, rambling post with so much information packed in. I prefer to split things into more bitesize pieces, but sometimes you have to just work with what you can! Awwww, these are so sweet. What a great idea. Great pockets, I love that little bee and how you coloured him. I think you did good to make the others strips white, it’s just a little more interest. Thank you so much for showing. Debby, these Valentine treat pockets are delightful. All the little touches–from the spatter to the cut doily edge–make these special. Glad you’re feeling better and hope the children are recovering well. Hope the flu has flown!